A friend of mine was recently trying to decide on if a toy purchase for her son was ‘’worth it’’. She didn’t want to start buying a bunch of useless toys for him to have her small house cluttered with kids stuff that was hardly used (a problem I can sympathize with). My house is overrun with kids stuff. Our daughter is the first grandchild, niece, baby in a long time and people love buying baby stuff despite us asking not to. We have made it quite clear we would rather have a contribution to her education savings than another doll or stuffed animal but people feed off that immediate toddler smile and ‘’thank you’’. However over the years though, a few toys have come into our lives that we love and have had hours of fun playing with. Gifts I am so grateful for, or money I’m so glad we spent. This is an easy one, but we’re big book lovers and I am all too happy to give another book a home. Reading is very important to us and though we have a few favorites that rotate every few days, we love having new stories come into our lives. You can never go wrong with giving a child a book. A few of our favorites from the last four years are the Oliva series; the Fancy Nancy series; Each Peach, Pear, Plum; Sandra Boynton (anything); Look and Find books (hours of fun playing eye-spy); A Very Hungry Caterpillar; The Kissing Hand; Are You My Mother and Sheep in a Jeep. I have hundreds of children’s books in my house and always looking for more! You may be able to find deals on these books using a ebay.ca coupon. I think it was for my daughters first birthday that someone gave her a huge gift of pretend food and accessories (pots/pans/bowls/spoons). Over three years later and these are still going strong. Where it started out as a good learning toy- identifying shapes, colors and types of food, she now interacts with them and role-plays which is really fun. A huge hit in our house. This was a gift from her babysitter when she turned two. Not only does she just love playing with the pretend money it is a huge learning opportunity for us to teach her financial lessons. Sometimes we’ll play grocery store with her pretend food and we’re at the point now of teaching her how many coins she needs to buy the things. Again, over two years later and this still consistently gets played with. Two years ago we had an opportunity to buy a small playhouse at a store for 60% off, we decided to go for it and she loves it. I think we paid $100 for it and have gotten a ton of use out of it. It’s plastic and we keep it outside year round. She goes from growing her pretend garden to literally shoveling the snow out of her front ‘’door’’. We play with it year-round and will continue to until she’s too big for it. My husband was given a collection of wooden blocks when he was a child and he was able to save them to give her our daughter. We have a few different types of blocks (everything from traditional Lego to wood blocks) and she loves them all. This is something I don’t see her growing out of anytime soon. It’s just that simple. We go though a ton of all of the above and she loves them. Some toys are a complete waste of money. We’re much better at picking our battles in terms of what we spend money on but we are very happy that a few toys have found their way into our lives and offered our daughter so much joy! 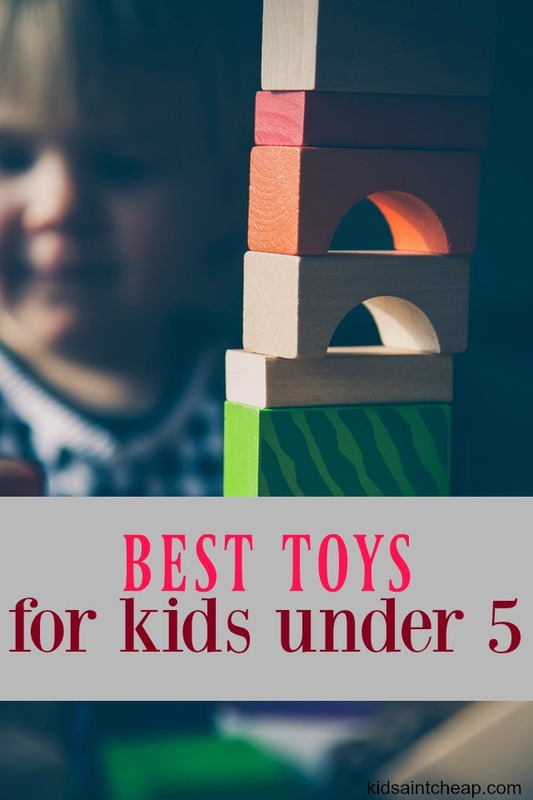 What are your favorite toys for small kids? Catherine is a first time momma to a rambunctious toddler. When she isn't soaking up all that motherhood has to offer, you can find her blogging over at Plunged in Debt where she chronicles her and her husbands journey out of debt. You can also follow her on Twitter.